Discussion in 'The Fashion Pack' started by sethii, Apr 29, 2009. As a sittings editor—“It’s an old-fashioned term, in the ’30s a Vogue shoot was a sitting,” she explained—each time Ms. Kotur prepares for a shoot, she researches her subjects exhaustively: checking their previous photographs, coming up with an original way to portray them and studying such minute details as the length of their hair, how they like to dress, their hobbies. “People think that you just arrive and take the photo, but it’s not like that. Everything is very thought out by the time we get there,” Ms. Kotur said. Of course, this has not been a good year for Vogue. The recession threatens to make the coverage of couturiers and socialites vacationing in Dubai seem crass and irrelevant. Ad sales are down, as they are everywhere. And last December, Ms. Horyn, The Times’ fashion critic, wrote an article addressing rumors that Ms. Wintour was to be replaced by French editor Carine Roitfeld, charging the magazine with being stale and predictable, its editor out of touch. Continuing the magazine’s tradition, Ms. Kotur is known to take an interest in the younger employees. Ms. Kotur was modest when asked about her own future at the magazine. The style director’s style may be somewhat reserved during the daytime, but in the evenings, she can often be seen in floor-sweeping Carolina Herrera dresses (she wrote a tribute book to the designer in 2004), austere cocktail dresses and elegant blouses with flattering necklines. Ms. Kotur attributed her look to her mentor, Ms. Levin, who upon her arrival at British GQ told her to throw out everything and invest in one beautiful cashmere sweater. “She said, ‘I don’t care if you wear it every day, just make it a good cashmere sweater,’” Ms. Kotur said. And she seemed amused at the idea that she was a beacon of self-effacement in a world of tiresomely popping flashbulbs. "Diligence is the mother of good luck," Benjamin Franklin once said. At first glance, one would consider Alexandra Kotur’s career — working as a senior features editor at Vogue and publishing Carolina Herrera: Portrait of a Fashion Icon as her first book — an indicator of very good luck. Diligence, however, is the reason behind Alexandra’s success. Alexandra’s path to professional achievements, though ultimately successful, was not without challenges. It was filled with bittersweet lessons that are tough to take at the time, but show their true value years later. Alexandra began at Chapin in 1974 as a Kindergarten student and graduated 13 years later. The study skills she learned and academic hardships she weathered here prepared her for her career in ways that still benefit her today. 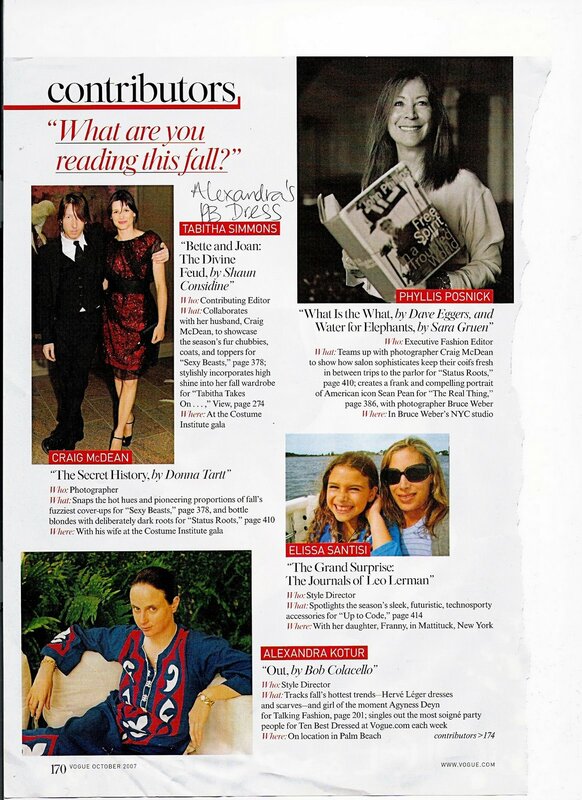 In Middle School history, for example, Alexandra acquired a note-taking style that she still uses when researching a subject for Vogue. She always adheres to former teacher Mrs. Putnam’s rule forbidding the use of the word “lifestyle,” and she learned in Class 12 physics that science, one of her main academic interests, offered incredible opportunities for creativity. For Alexandra, academic success was not always immediate. “I was devastated in Class 8 when I learned that I would have to repeat algebra,” she recalled. “I am so grateful now that I repeated that subject, since algebra has helped me enormously with my job at Vogue.” The principles she learned taught her how to simplify complicated situations and helped her to process information from her story research. The rigorous Chapin curriculum, coupled with encouragement from faculty, fostered Alexandra’s diligence and instilled in her the confidence to persevere through challenges. She said her physics teacher, Gene Gardino, now the school’s director of counseling services, was especially supportive: “Mr. Gardino taught me that I could do anything if I put my mind to it, and for that I will always be grateful,” she said. Alexandra transferred to Middlebury College after one semester at Columbia and went on to graduate with a degree in art history. She had known even as a teenager that she wanted to work as an editor at a magazine, but she spent two years working through a difficult program in economics and pre-medicine before realizing that these subjects were not for her. Once she became an art history major, she began to flourish in a creative environment. An honor student during her junior year, Alexandra graduated in 1992. She found a job as a fashion assistant in London at GQ magazine; having had a mother who was a fashion illustrator in the 1960s and 1970s, the position was well suited to Alexandra’s interests. She worked with an editor who taught her a lot about photography and portraiture and led her from the deserts of Pakistan to the mountains of Colorado in pursuit of great photographs. After working in London for three years, Alexandra moved back to New York and with luck on her side, she got a job in the features department at Vogue magazine. As a senior features editor, Alexandra works mostly on the visual side of the magazine and her assignments at Vogue have included visits to the Clintons and Bushes at The White House, time with Nicole Kidman on the set of Moulin Rouge in Australia, and contact with numerous politicians and celebrities. In August 2003, she traveled to Afghanistan for a story about the opening of a beauty school. Her latest feature was the recent debut of her first book, Carolina Herrera: Portrait of a Fashion Icon; she hopes to write another one soon. In the meantime, she will continue her work at Vogue and will travel to Hong Kong to visit her sister, Fiona Kotur Marin ’84, and Fiona’s two young sons. 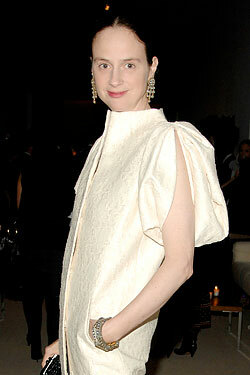 Vogue's Alexandra Kotur, in Carolina Herrera. Sheila Camera Kotur, Alexandra Kotur, and Fiona Kotur Marin. She's no longer at Vogue. She's now the Creative Director of Town & Country.